Kounoupidi me Patates Kapamas (pr. kou-nou-PEE-dee MEH Pah-TAH-tess Kah-pah-MASS) is a simple vegan Greek Stew with potatoes. You can also make the dish without the potatoes and serve it as a side dish. Did you know that in the Middle Ages the British used to call the cauliflower “Cyprus Colewort”? It is believed that the cauliflower originated in Cyprus, where the oldest record dates from the 6th century b.C. Cauliflower, arrived in Europe from Cyprus by the Venetians. It was then introduced to mainland Europe through Italy in the mid-16th century and only when King of France, Louis IIV tried it and liked it, it became very popular. Since then they began to cultivate it, especially in the region of Brittany. You won’t find many cauliflower recipes on my blog as my children hate it. When I was in Athens I used to say to myself that once we moved to Nafplio, we΄ll be eating cauliflower much more often and we now do. This is one of the recipes my mother used to make quite often. While I was cooking it the wonderful aroma of cinnamon filled the house and evoked so many beautiful memories. My mother did not add any wine or garlic to this dish but we love garlic so I added a clove but for some unexplained reason, the last time I started making it, I felt as if the cauliflower was shouting to me in my head: “add some wine, add some wine, add some wine”. I trusted my instinct and the stew turned out much richer as it contributed a refreshing fruitiness that mingled well with the other ingredients and complimented their flavors. Heat the olive oil in a nonstick frying pan. Fry the potatoes on both sides. Remove them in a pot and do the same with the cauliflower. If necessary add more olive oil. After removing the cauliflower sauté the onion until soft and add garlic. Add the wine and wait a few minutes until the alcohol evaporates. Add the tomatoes, tomato paste, salt, pepper and cinnamon as well as the vegetable bouillon. Mix and when it comes to a boil transfer it into the pot. Add water to cover it and cover the pot with the lid. Lower heat and simmer until the vegetables are tender, about half an hour to 45 minutes. Remove the lid and simmer until sauce thickens without overcooking it. Serve with freshly grated black pepper on top (optional). Interesting. I’ve never cooked the cauliflower greens with the cauliflower…flower (?) before. I do enjoy Greek stew-like dishes. They were the best part of my mom’s cooking. Hi Helen and thanks for commenting. When the cauliflower is small and the leaves are very tender, I use them as they are delicious. Delicious! Two of my favorite vegetables. wonderful dish! so glad to discover another way to cook this veggie which we love here as well. 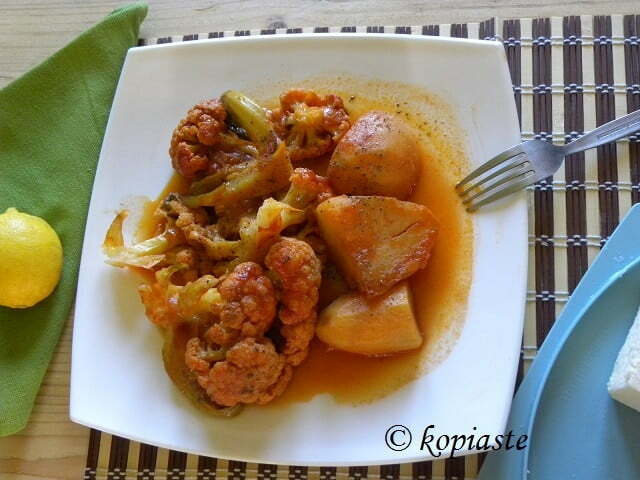 Very nice: I like the combination of cauliflower and tomatoes.